Central Government’s announcement came after Chief Minister J.Jayalalithaa had made a plea to Prime Minister Narendra Modi seeking that the floods be declared as National Disaster. Under this declaration Parliamentarians are advised to pend up to 1 crore rupees under their MP Local Area Development Scheme (MPLADS) for reconstruction and rehabilitation works in the in flood-affected districts. In this regard, MPs can send approval letters to the Union Ministry of Statistics and Programme Implementation. The 2015 South Indian floods was a severe natural calamity caused by heavy rainfall on 15–16 November during the annual northeast monsoon seson. The worst affected areas were are located on the Coromandel Coast region of the South Indian states of Tamil Nadu, Andhra Pradesh and the union territory of Puducherry. Chennai, capital city of Tamil Nadu was particularly hard-hit. Earthquake of 8.3-magnitude on Richter scale has hit off Chile’s coast in Illapel, the capital of Choapa Province in central Coquimbo Region of Chile. US Geological Survey has noted its epicenter at a depth of 12.5 kilometers off Chile’s coast in Illapel. After the initial earthquake, two aftershock quakes of magnitudes 6.2 and 6.4 occurred west of Illapel. The PTWC also issued tsunami alert for waves of between 0.3 to 1 metres for Japan, Antarctica, and most of the South Pacific countries including New Zealand, Tonga, Fiji, Vanuatu and Solomon Islands. 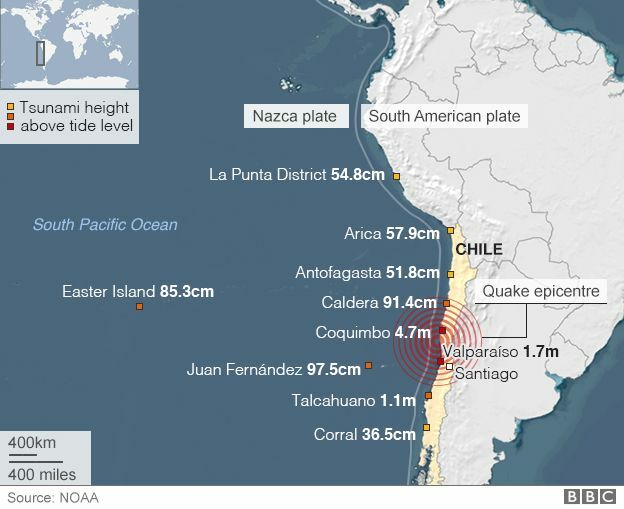 Chile is one of the world’s most earthquake prone countries as it lies on so called Pacific Ring of Fire. It is located on the seismically active location that runs along the boundary between the Nazca and South American tectonic plates. These plates are continuously grinding each other at a rate of up to 80mm per year. The strongest earthquake recorded on Earth of magnitude 9.3 on Richter scale had hit Chile in 1960 which had killed more than 5000 people.